Have you noticed a few “bald spots” on your dog? He could have ringworm, and this should cause you to stand up and take notice. Unlike other diseases that affect your pooch, ringworm is a condition that could affect you. Needless to say, you’ll want to 86 it post-haste. Ringworm is not a worm at all. Rather, it is a highly contagious parasitic fungus that comes from a family of fungal organisms known as dermatophytosis. The disease is known for attacking a dog’s skin, hair, and nails. Not too surprisingly, puppies under a year old are most susceptible to ringworm. Dogs that are stressed out or have weaker immune systems brought about by conditions like malnourishment also have a greater risk of catching the condition. It should also be noted that the condition can quickly spread through shelters and other places featuring dogs in close quarters since it is highly contagious. While this disease tends to be more common in cats, dogs can pick up and suffer from this highly contagious condition. What’s more, the disease can also be transferred to humans, and can cause all kinds of nastiness if left unchecked. This is especially the case with children, the elderly, and those with a weakened immune system, such as those that are undergoing chemotherapy. The main visual clue you’ll see if a dog has ringworm is a crusty, patchy “bald spot” that will appear on a dog’s fur. These spots are caused by cuts that typically show up on a dog’s head, paws, ears, or front legs. These bald spots may look red in the middle. These patches will clue you in on the severity of the condition. You may only find a few broken hairs here and there on your dog’s body if he has a mild case. On the other hand, his body will be riddled with these blemishes if he has a severe case. If you are dealing with just one isolated cut on a healthy dog, the ringworm will heal on its own within a four month period. If you see more than one cut on your dog, there are several options you can go to provide healing to your pooch. These methods can also be used to expedite the healing process of an isolated incident. For instance, you can deploy the use of various creams and ointments directly to the effected portion of your dog’s skin if he’s suffering from a mild case of the disease. If the ringworm is more widespread, you may be able to obtain an antifungal shampoo to wash his entire body. 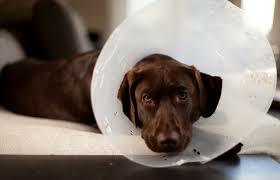 You should only use these particular products as prescribed by the vet, as other products may exacerbate the condition. If you go to the vet, and your dog has more than a mild case of ringworm, your vet will most likely prescribe an oral anti-fungal drug to take care of the situation. If your pooch does get prescribed this particular treatment, it is important that you carry out the treatment for the duration of the prescription, even if your dog looks fully healed. Breaking treatment off prematurely could cause the ringworm to come back. If your dog has a severe case of ringworm, you may want to consider quarantining your pooch during treatment due to contagious nature. If you decide to go this route, bear in mind that it could take up to as many as six weeks of treatment in order for it to be effective. Your vet may also recommend the use of an Elizabethan collar if he prescribes an anti-fungal cream in order to prevent ingestion. Ringworm is a rather dangerous condition for your pooch - and you - to deal with. However, when you consider all of the ramifications that are associated with the condition from both a canine and a human perspective, it becomes quite clear that it’s a condition that must be tackled head-on and rather aggressively. But when the condition is eradicated, you’ll be left with a healthy, non-contagious dog that you won’t be worried about contracting a disease from - something that makes the treatment totally worthwhile.